Yes, I recovered from that very compelling fantasy about apprehending the bad guys. But that doesn’t exactly mean that I was avoiding it. Yesterday on a bike ride near-but-n0t-at the scene of the crime, I saw that sinister gold van. Whatwhatwhatwhatwhatwhathwhat? WHAT?! 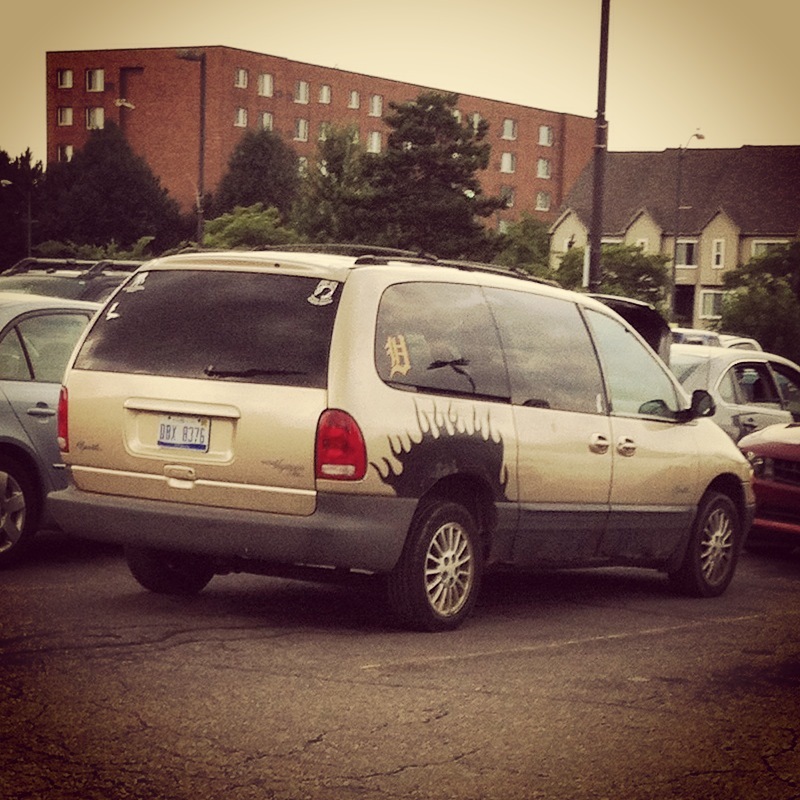 For the second time in a week, I stared dumbly at the parking lot in front of me, unable to process what I was seeing. I hadn’t actually seen the van at the time of the theft but there is no mistaking a “gold van with black flames on the back.” This was it. Immediately, I was soaring on adrenaline but I tried to stay calm. I “casually” circled the lot, took some pictures of the van and got the license plate numbers. There were a bunch of youngish guys hanging out around the van and a few other cars. I called the Wayne State Police (in my experience, a 1000% faster response time). I waited. I schemed. I thought about parking behind the van with another car (or my bike?) to trap it in place in case the cops didn’t get there in time. I worried about the awkward situation wherein I would suddenly have 2 computers instead of none! I decided that I would give my now-spare computer to the Detroit Library (Vote “Yes” on Proposal L!). I still knew that it was a 1% chance that we’d catch the thieves and a 1% of 1% chance that I would then get my computer back but that didn’t stop me from dreaming. The police confirmed that this van has been involved in a string of smash-and-grab thefts in the immediate area around Warren and John R. My first thought is, “ok so let’s wrangle them up and get to business!” Not so fast. It seems that the major downfall in all of this is the fact that neither I, nor anyone else can “positively ID” the people who committed the crimes associated with the van. That’s the genius of these thieves- even though their van is one-of-a-kind blatantly identifiable, they remain all but invisible thanks to the van’s sliding doors and tinted windows. It’s speculation, it can’t hurt that they get to avoid the fashion faux-pas of wearing masks in broad daylight. I wish we could’ve staked out the parking lot in an unmarked cop car and catch the guys in the act. I wish we could follow them back to their respective apartments to find all the stolen bounty that had long ago been given up for lost. I wish we had a CSI-style investigation that resulted in the resolution of dozens of cold cases. But it was not to be. The van was towed away on a technicality, the passengers got away with a scare and one less means of transportation. This entry was posted in Detroit and tagged Detroit. Bookmark the permalink. Welcome to Black-Run America (BRA). There is no escape from Detroit; there is no escape from America.Your fate is nothing more that of Steve Utash. The same goes for America; we give a helping hand to the black community and they’ll beat the f*ck of you regardless. And steal your wallet.